BANGKOK – An Omani man who became Thailand’s first case of Middle East Respiratory Sydnrome (MERS) has been declared free of the deadly virus, Thailand’s health ministry said on Monday. The 75-year-old man, who had traveled to Bangkok for treatment for a heart condition and was then diagnosed with the virus, will remain in quarantine for the time being. “In the last test results we did not find the MERS virus in the patient,” Surachet Satitramai, acting permanent secretary at the Public Health Ministry, told Reuters. He said three of the man’s relatives who traveled with him to Thailand were also free of the virus. Thailand’s health ministry is still monitoring 36 people who were exposed to its single patient. Thailand confirmed its first case of MERS earlier this month, becoming the fourth Asian country to register the virus this year. In South Korea, which is battling the largest MERS outbreak outside Saudi Arabia, 31 people have died from the virus. South Korea’s public health ministry reported one new case on Friday, taking the total to 181. Health authorities have said the virus may have leveled off but were more guarded in their assessment last week. 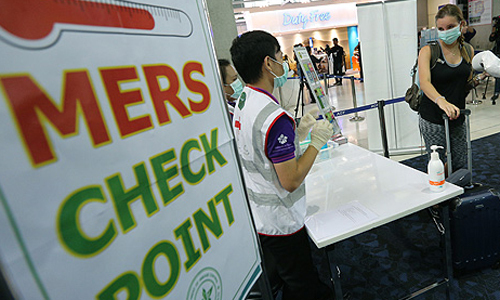 Thailand’s status as a hub for medical tourism could be helping it contain the spread of MERS, government and health officials said last week. First identified in humans in 2012, MERS is caused by a corona virus from the same family as the one that triggered the 2003 outbreak of Severe Acute Respiratory Syndrome (SARS).